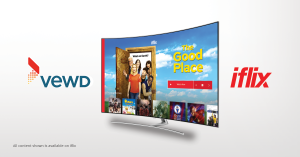 Oslo, October 11, 2018 – Vewd, the world’s largest smart TV OTT software provider, and iflix, the world’s leading entertainment service for emerging markets, have partnered to make iflix available on millions of Vewd enabled devices. With more than 15 million subscribers across Southeast Asia, the Middle East and Africa, smart TV manufacturers and pay TV operators consider iflix a “must have” in their app catalog. iflix worked with the Vewd team to certify the iflix app for the Vewd ecosystem. Certification means the iflix app can be deployed across millions of connected TVs and set-top boxes without challenging technical integration. The app just works, right out of the box. “We aim to give users the freedom to enjoy iflix on any screen of their choice – from their 6” mobile screen to 65” big screen television. Our partnership with Vewd is an important step to fulfilling that promise. Vewd’s leading-edge technology and connected Smart TV ecosystem allow us to integrate with platforms efficiently, whilst offering users an uncompromising user experience,” said Mark Britt, CEO, iflix. Expanding iflix’s reach comes as demand for OTT services heats up throughout the Asia-Pacific region. Total subscriptions in the region already overtook North America in 2017. By 2022, Digital TV Research estimates the region will account for 43% of the world’s OTT subscribers. Going to MIPCOM? Learn how Vewd empowers leading entertainment companies like iflix. Click here to schedule a meeting.